Leaking boric acid ate a 6-inch wide hole around the steel cladding of Nozzle #3 in the reactor head at the Davis Besse nuclear power plant near Toledo, Ohio. 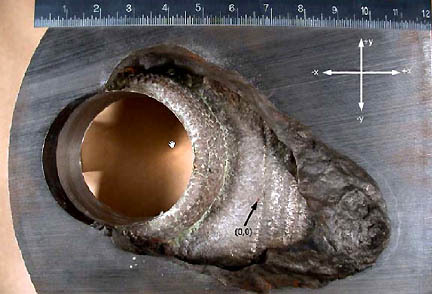 Discovered in 6-inch steel casing and photographed in March 2002. Plant shut down to avoid potential core melt down. Photograph from Nuclear Regulatory Commission. The boric acid leaks and eroded hole found at Davis-Besse in early March 2002 were described by the NRC’s own Inspector General in an October 22, 2003, review assessment as “the most extensive corrosion ever found at a U. S. nuclear power reactor” and provoked inspections of 68 more of the nation’s 103 reactors that provide electricity in thirty states. The Davis-Besse nuclear power plant is located in Oak Harbor, Ohio, on a site covering 954 acres, of which 733 acres is allocated to a National Wildlife Refuge. The plant’s Operator License was first issued on April 22, 1977, and is now owned and operated by FirstEnergy Corp.
FirstEnergy’s website describes itself this way: “A registered public utility holding company headquartered in Akron, Ohio. Its seven electric utility operating companies comprise the nation’s fifth largest investor-owned electric system, serving 4.4 million customers within 36,100 square miles of Ohio, Pennsylvania and New Jersey. Our Corporate Vision is to become the leading retail energy and related services provider in the northeastern quadrant of the United States.” It lists $12.2 billion in annual revenues and approximately $33 billion in assets – both numbers reduced when Davis-Besse is shut down. 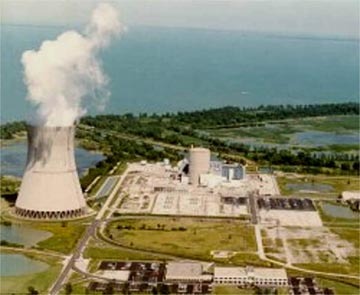 FirstEnergy owns four nuclear power plants: Davis-Besse in Oak Harbor, Ohio, 25 miles east of Toledo; Beaver Valley 1 and 2 in Pennsylvania; and the Perry plant in Cleveland, Ohio. Davis-Besse nuclear power plant has a 13,387 megawatts of electricity generating capacity, 11,502 miles of transmission lines, and 84 interconnections with 13 electrical systems. Photograph © 2003 by The Plain Dealer. Jack Grobe, Chairman, Davis-Besse Oversight Panel, Nuclear Regulatory Commission (NRC), Cleveland, Ohio (M. S. 1979, Bio-Nucleonics, Purdue University): “IS IT TRUE THAT IF THERE HAD FINALLY NOT BEEN AN INSPECTION IN MARCH 2002, THAT THE BORIC ACID HOLE COULD HAVE LEAD TO A CORE MELT DOWN EVENT? Well, if the crack was left unabated and the corrosion was left unabated, it’s possible that the cavity could have continued to grow. It’s important to understand that the inspections that would have been conducted during the shutdown that the NRC desired to have completed by the end of December 2001. But after Davis-Besse’s appeal to delay the (inspection) outage, it was re-scheduled for March 31, 2002, through a series of discussions regarding the risk to the public of continued operation. Then the NRC finally agreed to let the plant operate until February 15, 2002, and then it was shut down and inspected. The cavity was discovered in early March before the March 31 deadline. The reactor head would have remained intact until that shutdown. So, there was no accident at Davis-Besse. There was no danger to the public. But there were certainly significant performance issues with FirstEnergy and the Davis-Besse facility. MEANING THEY WEREN’T PERFORMING EXAMINATIONS OF THE PIPES AND THE NOZZLES VERY WELL. In fact, there were approximately 29 different ‘condition reports’ ­ that’s a phrase that FirstEnergy uses to describe an internal company document that describes what we call a ‘condition adverse to quality,’ which means something is not the way it is supposed to be. There were upwards to 30 different condition reports over a series of about half a decade that if they had been properly followed up would have lead to this discovery much earlier. It was not a matter of the information not being available to First Energy ­ it was their inability to properly deal with the information it had at its disposal. ISN’T THAT ONE OF THE CRITICISMS OF THE NRC THAT SOME HOW YOUR DOING OVERSIGHT, BUT DEPENDING UPON THE PLANTS THEMSELVES TO BE SELF-REGULATING AND SELF-MONITORING WHICH DOESN’T ALWAYS WORK? We do extensive inspections every year at every nuclear power plant to the tune of several thousand hours of inspections. BUT YOU JUST SAID THE PROBLEMS AT DAVIS-BESSE HAD BEEN GOING ON FOR AT LEAST FIVE OR SIX YEARS WITHOUT CORRECTIONS OF PROBLEMS THAT THE FIRSTENERGY OWNERS AND NRC ALREADY KNEW THEY HAD. Yes. That’s correct. We have two inspectors assigned to every nuclear power plant in the United States. Some plants we have more if they have more than two units. At Davis-Besse, because of the problems they have had, we have assigned a third inspector. It’s the only single unit plant in the United States that has three full time inspectors on site every day. We have a staff of about 50 engineers and scientists in the Chicago office, as well as Philadelphia, Atlanta and Dallas, that travel out to the plants in our region. These are specialists in various areas: security and safeguards; radiation protection; emergency planning; chemistry; and the various engineering disciplines of mechanical, electrical. Those specialists travel from plant to plant and do inspections. So, there is a significant amount of inspection at every facility every year. IF THAT IS TRUE, HOW DID THIS HOLE DEVELOP AT DAVIS-BESSE OVER HALF A DOZEN YEARS? While we do a substantial amount of inspection, our inspection has to be a sampling. Let’s deal in round numbers because they are easier. Each utility has approximately 1,000 employees working at the site that’s a single unit plant day in and day out. It’s usually between 700 to 900, but approximately 1000. And we might have 20 to 30 inspectors visit the site each year, something on that range. So, we have to use an informed sampling approach. What we do is what is referred to as a ‘risk informed performance based inspection’ approach where we look at those activities that are most risk-significant. Our resident inspectors attend regular planning meetings at the facility every day and they are there every week of the year. 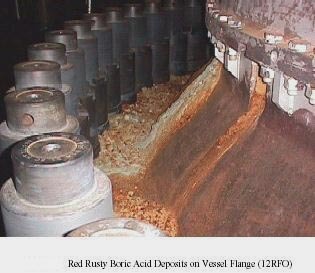 In fact, during the specific photograph you showed at your website, Earthfiles.com, (red boric acid leaking on the inside the top of the nuclear reactor vessel head shown in photos above) which was released by us (NRC) actually ­ was taken during a 2000 refueling outage. That is the photo that is commonly referred to as the ‘red photo.’ The resident (NRC) inspectors were aware that the utility had discovered boric acid on the reactor head. They monitored the utility’s activities. They did not specifically inspect that activity. They chose other activities during the refueling outage to inspect. WHY WOULDN’T ALL THAT BORIC ACID THAT WAS SPILLING DOWN IN ALL THAT RED BE A RED FLAG THAT THERE WAS A SERIOUS PROBLEM SOMEWHERE? It was an indicator of an issue that the residents needed to be concerned about and they concerned themselves about it not by directly inspecting that specific activity, but by monitoring the utility’s progress through status meetings. And there were regular reports on the cleaning activities and prior to the restart of the facility after the 2000 outage, the staff reported to their management that the head had been cleaned and inspected and there were no problems. That caused the resident inspectors to conclude they didn’t need to spend inspection resources on that specific issue and focused their inspection time in other areas. BUT HOW CAN YOU MONITOR THROUGH MEETINGS? WOULDN’T THE ONLY SUCCESSFUL WAY BE TO GO PHYSICALLY TO THE PLANT TO THE AREA THAT WAS PHOTOGRAPHED TO SEE IF IN FACT IT HAD BEEN FIXED? Right. We don’t inspect through meetings. I don’t want to give you that impression. OH, I THOUGHT THAT’S WHAT YOU SAID YOU DID. In this specific case at Davis-Besse, the inspectors chose not to specifically inspect that activity. They were out inspecting other activities. We have to pick and choose those activities that we are going to inspect. 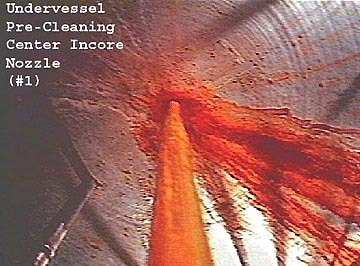 In fact, they didn’t choose this one (to inspect the reactor vessel head that had been stained red with boric acid in photographs taken as early as 2000 and filed at the NRC). THAT WOULD MEAN THAT THE NRC HAD SEEN SOMETHING ON PAPER ONLY AND THEY DIDN’T GO AND INSPECT IT BY EYE. THAT’S WHAT I MEAN: HOW CAN YOU INSPECT PROBLEMS THROUGH COMMITTEES, MEETINGS OR THAT SORT OF THING? Just to give you a proper perspective. There are some 3,000 of these condition reports on average written at each plant each year. We could certainly not inspect every one of them. We have to choose which ones we are going to inspect. Our inspectors unfortunately chose not to inspect this one at Davis-Besse because there were regular reports coming in (from First Energy) that it was not of concern. They chose to inspect other condition reports that appeared to be of greater concern. THAT’S WHY DAVID LOCHBAUM WITH THE UNION OF CONCERNED SCIENTISTS SAYS ON TAPE IN MY REPORTS, ‘DAVIS-BESSE PLANT OPERATORS LIED TO THE NRC ABOUT CONDITIONS AT THE PLANT, PARTICULARLY WHEN THE NRC WAS PREPARING TO SHUT THE PLANT DOWN FOR SAFETY REASONS. THEY LIED TO THE NRC ABOUT THE SAFETY OF THE PLANT AND THAT IS INEXCUSABLE.’ COULD YOU COMMENT? Shortly after the plant was shut down and the cavity (hole) was identified in the reactor pressure vessel head, we conducted what we call ‘an augmented team inspection.’ That is an inspection that involves not only regional staff, but also staffs from various headquarters offices. During the course of that inspection, we identified a number of documents that may have contained inaccurate information. THAT’S WHERE THEY DID LIE? The inaccurate information was documented in the NRC’s inspection report from that inspection and we had a separate organization called the Office of Investigations that followed up on how that information came to be inaccurate. Their investigation was completed in the fall of 2003 and the results of that investigation were provided to the Dept. of Justice for consideration of whether or not there was basis for any further evaluation. IS IT A FAIR ASSESSMENT TO SAY THAT THE OWNERS OF THE DAVIS-BESSE PLANT DID LIE? The Dept. of Justice is continuing to evaluate the facts and circumstances that surrounded Davis-Besse providing inaccurate information to the NRC and that federal investigation is ongoing and is being run out of the U. S. Attorney’s office in Cleveland, Ohio, and being supported by Dept. of Justice staff from Washington, D. C., as well as NRC staff. IF THE OWNERS OF THE DAVIS-BESSE PLANT DID LIE, WHAT IS YOUR PERCEPTION AND UNDERSTANDING ABOUT WHY THEY WOULD LIE? I have no reason to speculate about the potential outcome of the ongoing federal investigation. YOU WANT TO AVOID SAYING ONE WAY OR THE OTHER WHETHER THEY LIED OR NOT? The agency has not determined the basis upon which the information came to be inaccurate. ISN’T THIS WHAT WENT DOWN? THE NRC RECEIVED SOME KIND OF A COMMITMENT FROM THE OWNERS OF DAVIS-BESSE THAT THE BORIC ACID THAT WAS LEAKING AND IS SHOWN IN THAT RED PHOTOGRAPH WAS GOING TO BE REPAIRED. AND THEN THE NRC INSPECTORS NEVER WENT TO FOLLOW UP. AND THEY WERE ASSUMING THE DAVIS-BESSE OWNERS WERE MAKING THE REPAIR, WHEN IN FACT THEY WERE NOT AND DID NOT. That’s correct. It’s not ­ oh, dear ­ I apologize that there is certain information I cannot share with you right now because of the ongoing investigation (Justice Dept. of Davis-Besse). But just to give you a sense of some of the issues. There is a difference between providing accurate information to us and maintaining accurate records. The company is required to do both: maintain accurate records and provide correct and complete information to us. The specific thing we’re talking about here is the accuracy of internal records and internal communications. These people (employees at First Energy) were not providing information to us. They were providing information to their bosses and we were listening (to the bosses). But the individuals responsible for cleaning the reactor head during the 2000 outage were lauded for their performance of cleaning and inspecting the head by their management. WHEN THEY HAD NOT DONE SO AT ALL. IN MY WORLD, THAT WOULD BE CATEGORIZED AS A LIE. That’s an issue between those individuals and their bosses. First Energy has investigated those and taken quite a few different personnel actions as a result of the performance of their staff at the Davis-Besse facility. THAT’S WHEN DAVID LOCHBAUM IS CONCERNED THAT THOSE INDIVIDUALS THAT WERE LYING ABOUT SOMETHING SO SIGNIFICANT AND POTENTIALLY DISASTROUS WOULD THEN LEAVE DAVIS-BESSE AND GO ON OUT INTO THE NUCLEAR POWER INDUSTRY AND GET JOBS IN OTHER PLANTS AND LIE AGAIN AND CAUSE PROBLEMS AGAIN. And that’s why we are monitoring the job responsibilities of individuals who are of concern to us, not just at Davis-Besse or First Energy facilities, but wherever they are working. In addition to the ongoing Department of Justice and NRC’s criminal investigation efforts, the General Accounting Office (GAO) is doing its own investigation and report about Davis-Besse for Congress. AND WHAT DAVID LOCHBAUM EXPLAINED TO ME WAS THAT HE THOUGHT THERE WAS A PATTERN AT THE NRC OF FEET DRAGGING ON NUCLEAR POWER PLANT ISSUES. THERE ARE STATUTE OF LIMITATIONS. IF THESE LEGAL ISSUES CAN BE DRAGGED OUT OVER 5 YEARS OR MORE, THEN THAT USUALLY ENDS WITH NOTHING HAVING BEEN RESOLVED AND NO PUNISHMENT APPLIED. I WONDER IF THAT IS WHAT IS GOING ON? Of course not. Let me tell you what has been going on for the past two years. The Davis-Besse facility shut down in February 2002 and the cavity in the head was discovered early in March of 2002. Since then, the NRC has had very aggressive oversight assessment of Davis-Besse activities. We immediately issued a confirmatory action letter that required the utility to obtain our approval prior to any consideration of re-start of the facility. There were five other conditions in that confirmatory action letter. Following that confirmatory action letter, the NRC established a special oversight panel which I chair. It’s co-chaired by a senior executive from our headquarters offices (in Washington, D. C.) and has a number of staff from the region in headquarters on the panel. That panel has provided oversight, inspection and licensing activities to insure that the issues that caused the degradation in the reactor head were clearly identified and resolved prior to any consideration of future operations at the facility. Over the course of two years, there were a number of enforcement actions issued as well as significant issues resolved. We established what we call a ‘Re-start Check List’ that should the Davis-Besse plant ever consider re-start, those issues had to be adequately resolved. There were 31 specific issues, including the completeness and accuracy of information on that Re-start Check List. All 31 issues and 6 issues and a confirmatory action letter were adequately resolved and once the panel believed that the plant could be safely re-started and operated, it made a recommendation to my boss, the Regional Administrator, James Caldwell, and to the Director of the Office of Nuclear Reactor Regulation in Washington, D. C., James Dyer, that it believed the plant could be safely re-started. Mr. Caldwell and Mr. Dyer reviewed that recommendation and on March 8, 2004, lifted the NRC restriction on the operation of Davis-Besse. In addition, one of the panel’s responsibilities during that time frame was to maintain close awareness of the ongoing investigation by the NRC’s Office of Investigations, and then subsequently, those aware of the ongoing federal investigation. One of the activities that the NRC staff did under the direction of Jim Caldwell, Jim Dyer and the panel was to carefully review the results of the Office of Investigation’s investigation ­ that’s our internal investigation ­ to make sure there were no outstanding issues in that investigation that could have an immediate impact on the safety of the plant. We concluded, based on a thorough review of those results, that there was no imminent safety concern. Where Are the Former Davis-Besse Employees Who Allegedly Lied? SOME EMPLOYEES WHO WERE LET GO FROM DAVIS-BESSE MIGHT HAVE GONE INTO OTHER NUCLEAR POWER PLANTS, RIGHT? In reviewing the results of the investigation, one of the concerns that we had was to insure that there were no individuals who may be implicated in deliberate violations of NRC requirements that are in a position of responsibility anywhere in the nuclear industry. And we confirmed that there was no immediate concern for safety. If in fact, the NRC has a concern about the integrity of an individual, it treats that concern as an immediate safety issue. BUT WOULDN’T IT BE LOGICAL TO CONCLUDE THAT INSIDE OF AN INDUSTRY SUCH AS NUCLEAR POWER PLANTS THAT PEOPLE THAT ARE TRAINED, WHETHER THEY HAVE WORKED IN ONE PLANT OR ANOTHER, THAT THEY ARE THE ONES MOST LIKELY TO KEEP GETTING JOBS AT OTHER NUCLEAR POWER PLANTS BECAUSE OF PAST EXPERIENCE? Absolutely, a person who is trained in nuclear safety matters can get a job in a nuclear industry. But I need to emphasize that based on the results of the investigation, we are carefully evaluating the roles that people are playing in the nuclear industry. Those individuals that we may have concern that may have deliberately violated our requirements and insuring there are no immediate safety concerns. In addition, the NRC has assigned a senior executive from its Office of Nuclear Reactor Regulation to maintain continuous oversight of the ongoing Grand Jury proceedings. Should the Grand Jury identify some new potential safety issue that we are not already aware of, that individual will have a responsibility to work with the Dept. of Justice so that the agency can gain access to that information and deal with it. ISN’T IT TRUE THAT IN 2001 WHEN THE NRC WAS NOT GIVEN FORTHCOMING AND STRAIGHTFORWARD INFORMATION FROM THE DAVIS-BESSE OWNERS, THAT THEY WERE IN FACT GOING THROUGH A MERGER AND ACQUISITION WITH ANOTHER UTILITY AND THEY WERE CONCERNED ABOUT THE STOCK PRICE IMPLICATIONS AND WHAT IT WAS SELLING FOR IN THE FALL OF 2001? I’m not aware of those details. If in fact inaccurate information was provided to the NRC for some ulterior motive, that is the purpose of the ongoing investigation and those issues will be resolved through that investigation. Could Terrorists Cause Nuclear Catastrophe Diving An Airliner Into A Nuclear Power Plant? IF A FULLY LOADED 747 WITH PEOPLE AND JET FUEL TOOK OFF FROM THE HARRISBURG AIRPORT AND SOME TERRORIST HAD THE ABILITY TO DIRECT THAT PLANE DIRECTLY INTO THE THREE MILE ISLAND NUCLEAR REACTOR FACILITY, DO YOU THINK THAT THE REACTOR FACILITY COULD RESIST THE IMPACT? We have a separate office. It’s called the Office of Nuclear Security and Incident Response (NSIR), and that office was established following the 9/11 tragedy to particularly bring into focus all of the agency activities that address those topics: nuclear security and emergency response. They work closely with the Dept. of Homeland Security in insuring that our plants are safe from potential outside influences. It’s necessary for the NRC to carefully protect information that could become public in these areas to insure that anybody who does have malicious intentions does not easily gain access to information regarding the power plants. So, beyond that comment, I cannot respond further. Are All 103 Nuclear Power Plants in the United States Getting Too Old to Remain Safe? Graphic which represents failure rates over time from the beginning of human or machine life where many accidents and mistakes occur, moving to lower failure rate with education and experience, and increasing failure rate again at “end of life wear-out.” Graphic provided by David Lochbaum, Union of Concerned Scientists. 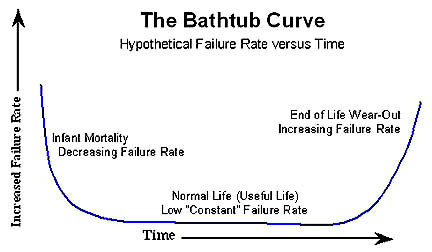 DAVID LOCHBAUM AT THE UNION OF CONCERNED SCIENTISTS SENT ME A ‘BATHTUB’-SHAPED CURVE THAT REPRESENTS GRAPHICALLY INCREASED FAILURE RATES WITH AGE, WHETHER HUMANS OR MACHINES SUCH AS NUCLEAR POWER PLANTS. ARE ALL 103 NUCLEAR POWER PLANTS IN THE UNITED STATES GETTING TOO OLD TO REMAIN SAFE? Nuclear power plants are continuously maintained. We have regulations. 10 CFR.50.65 is our maintenance rule that requires each utility to monitor the performance of every key system and not just safety systems, but power production systems that could cause a transient on the reactor. They are required to insure that those systems maintain an acceptable level of performance and that requires continual maintenance and periodic replacement of equipment and modification of the equipment to upgrade the reliability of the equipment. It’s inappropriate to believe these plants are aging in the context that they were built 25 to 40 years ago and have not been updated since then. They are continuously maintained and modified to current standards. Many modifications were performed during the extended shut down (at Davis-Besse) and many of those were not necessarily required, but because the plant was shut down for an extended period of time (two years), First Energy chose to use that time to implement modifications that they may have had planned for some other future outage. Are the NRC and Nuclear Power Plant Owners Too Financially Dependent On Each Other? A PROBLEM I HAVE HEARD DESCRIBED IS THAT THE NRC AND NUCLEAR POWER PLANTS OWNERS ARE TOO CLOSELY INVOLVED, HAVE MUTUALLY SELF-SERVING MONETARY PROFIT INTERESTS WHICH COMPROMISE THE NRC’S ABILITY TO BE OBJECTIVE REGULATORS. The only financial relationship that we have ­ I guess there are two, if you want to describe enforcement as a financial relationship. We can issue civil fines. We call them ‘civil penalties.’ These are large monetary fines against utilities and we do that when it’s appropriate to do so and we have an enforcement policy that guides us in that area. The other financial relationship we have is that the utilities have to pay for our services. We are a fee-based agency, so if there is a need for a licensing change to a license, then that costs money and they have to pay that. Each of our inspections that we do, we charge the utility for those inspections. They pay for us. But as far as any influence, the utilities cannot have any influence over us. BUT THE VERY FACT THAT THEY HAVE TO PAY YOU FOR INSPECTIONS. RIGHT THERE, YOU HAVE VULNERABILITY FOR ALL KINDS OF CORRUPTION. WHY SHOULD THE OVERSIGHT GROUP THAT IS SUPPOSED TO BE OVERSEEING THE SECURITY OF NUCLEAR POWER PLANTS HAVE TO BE PAID BY THE NUCLEAR POWER PLANTS? WHICH POWER PLANT OWNER WANTS TO DO THAT? I would suspect that none of them want to do it, but those are the laws Congress has established. Let me make it clear: the nuclear power plant owners don’t get to choose whether they have an inspection. Congress has established the NRC, as well as many other agencies ­ as what is referred to a ‘fee-based agency.’ So, Congress gives us our budget and establishes our mandate and we report to the Executive branch of the government, we report to the President. But the agency is nearly 100% fee-based. meaning very little of the budget to run the agency comes from the general taxes on the American public. The vast majority of the money to run the agency comes from fees that we charge to our licensees, both power plants and radioactive materials users, industrial and medical users. WHAT IS THE INCENTIVE FOR THE OWNERS OF NUCLEAR POWER PLANTS TO GO TO YOU TO ASK FOR INSPECTIONS THAT THEY PAY FOR? They don’t ask us. We do the inspections that Congress mandates and that our programs require. They can’t refuse an inspection and they don’t ask for an inspection. We perform the inspections that are necessary to make sure that the public is safe. THEN YOU CHARGE THEM FOR THE INSPECTION. WHAT DO YOU SAY THOUGH TO PEOPLE WHO COMPLAIN THAT THERE IS A CULTURE OF INSIDER RELATIONSHIP BETWEEN THE NRC AND THE OWNERS OF NUCLEAR POWER PLANTS? For questions or concerns about Davis-Besse – Jack Grobe, Chairman, Davis-Besse Oversight Panel, Nuclear Regulatory Commission (NRC), Cleveland, Ohio, welcomes calls to the Region 3 NRC Public Affairs Office: 630-829-9662. In early April 2004, the U.S. – Canadian electric power blackout task force reported that many of the causes of the August 14, 2003, blackout that knocked power out in eight states and two Canadian provinces were similar to those of previous blackouts.The international investigators pointed a finger at FirstEnergy Corp. and said the nuclear power utility could have isolated the blackout to Greater Cleveland if it had cut power to some of its customers when voltage on its 345,000-volt lines began to collapse. The Plain Dealer in Cleveland reported on April 6, 2004, “But computers in the Akron-based utility’s control center failed that day and sloppy operating procedures, lack of emergency planning and poor training of grid managers made shutting down portions of its customers, called ‘load shedding,’ all but impossible. The blackout task force asked Congress to toughen mandatory reliability standards for electric utilities and add penalties for companies that violate them. The group recommended 46 changes and wants to keep meeting in an oversight capacity to insure the changes are done to prevent repeats of massive power failures.